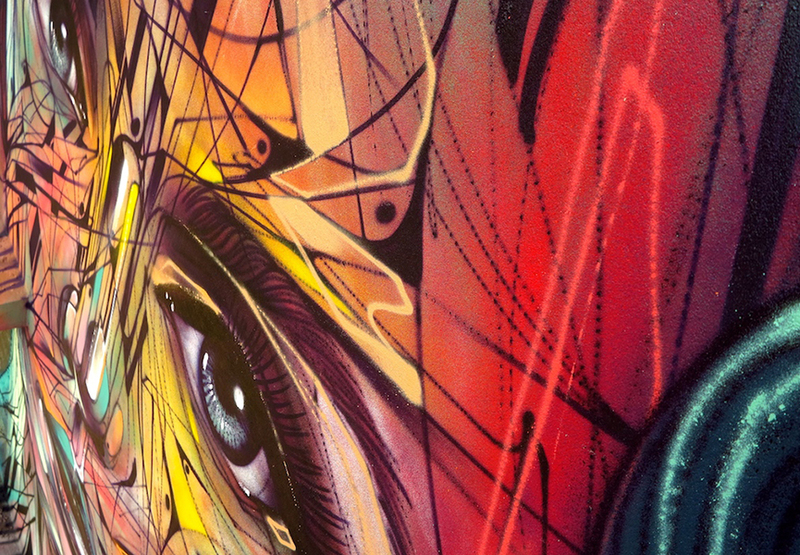 This week Street Update features the latest murals from some familiar artists as well as some newcomers to your mural selection. 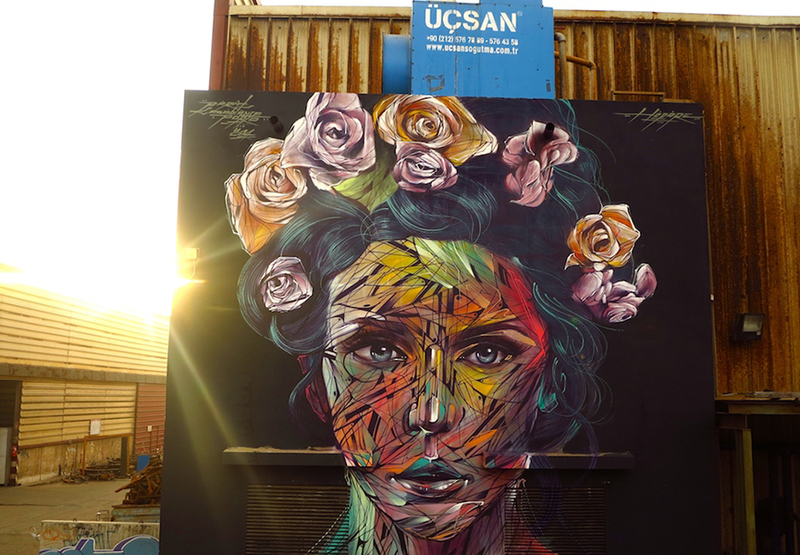 We have returning artists: Herakut in with two magnificent pieces in LA; the Parisian artist Hopare traveled across the Mediterranean to bring his beautiful women to Morocco; and Nychos who dissected a little mermaid on a glass façade. 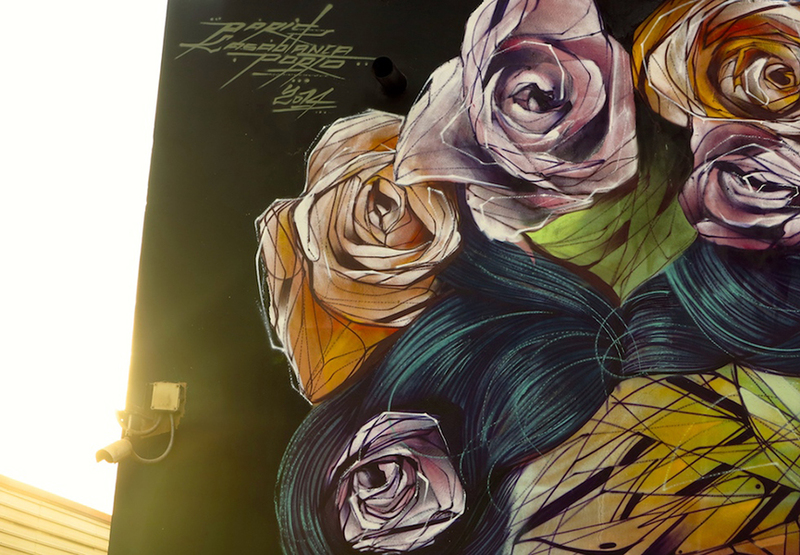 The artists featured here for the first time are Numskull from Australia and the produce of his residency in Vienna and ZED1 from Italy that painted a wall in Turin. As always enjoy the beautiful artwork that these talented artists have created. 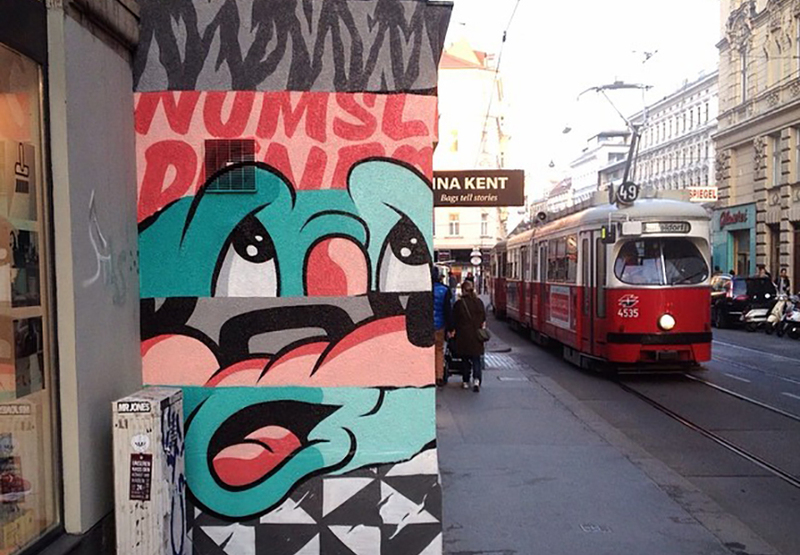 The Australian artist Numskull was invited PERFEKT WORLD to participate in a one Artist-in-Residency program at quartier 21 in Vienna. 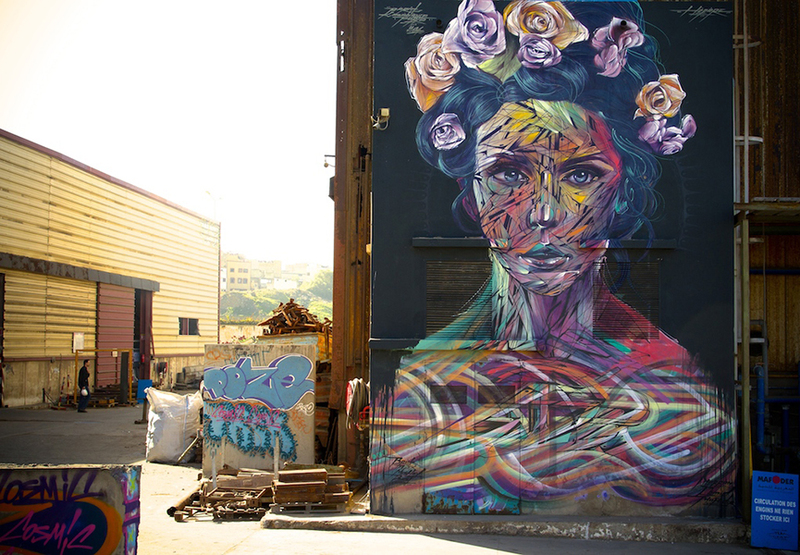 The artist will live and work in the district. 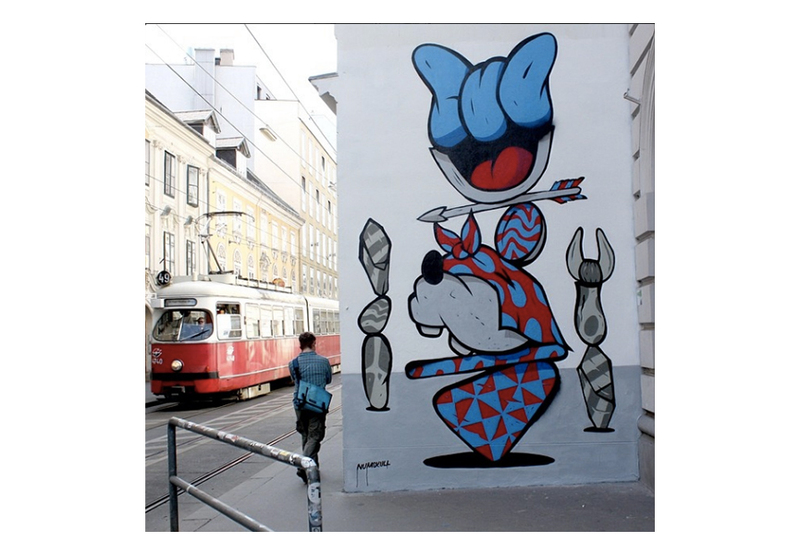 The residency is rounded off by an exhibition at PERFECT BOX and the murals organized by inoperable he painted on Siebensterngasse. 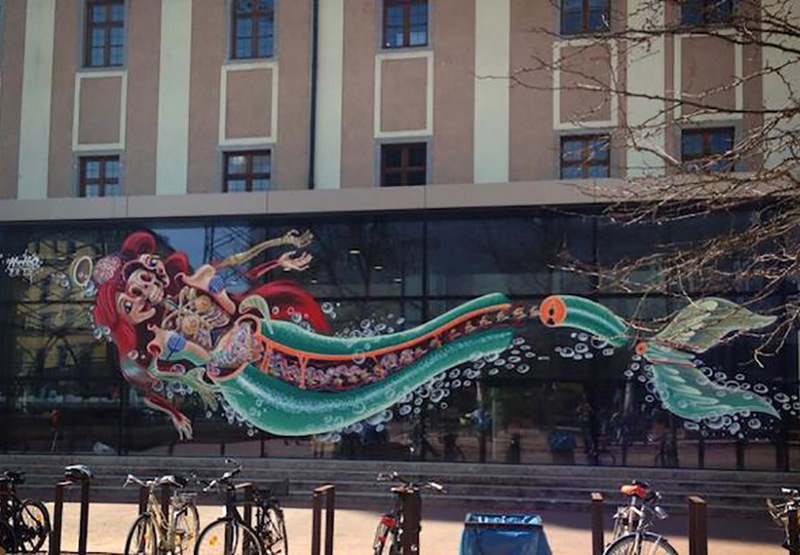 The murals are like exhibited paintings comical, bold and colorful and explore the artists fascination of the human obsession for beauty. The everyday struggle to keep up appearance is expressed through the chaos and muddled parts of the face. 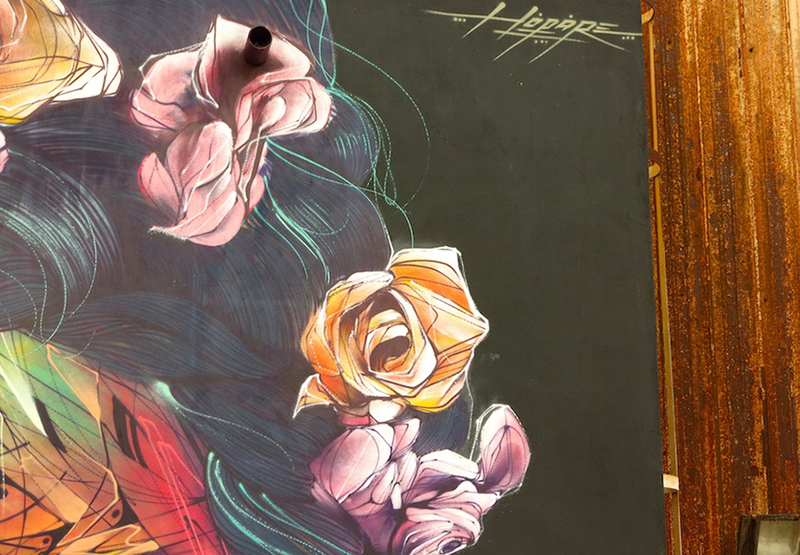 This time the Austrian graffiti artist dissected Disney’s little mermai (she looks happy though). 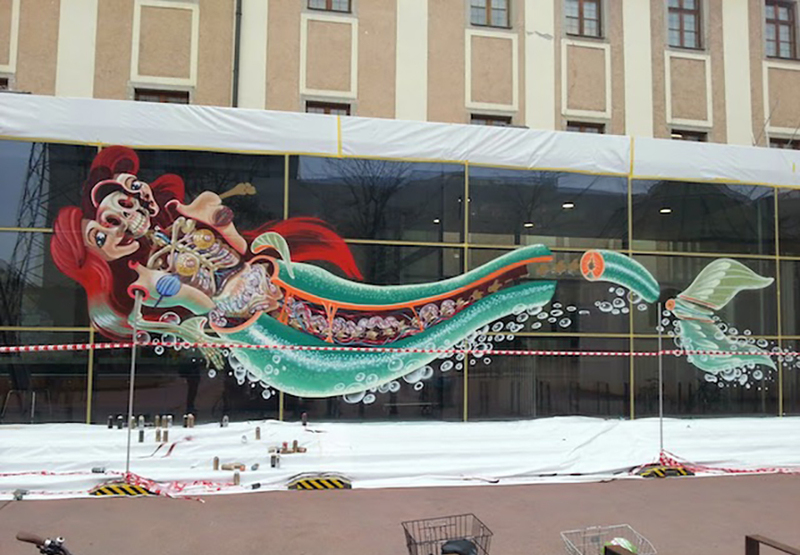 Nychos’ “Rabbit Eye Movement” was in Linz for the NEXTCOMIC Festival and contributed the “Dissection of the Little Mermaid” as a glass façade mural. 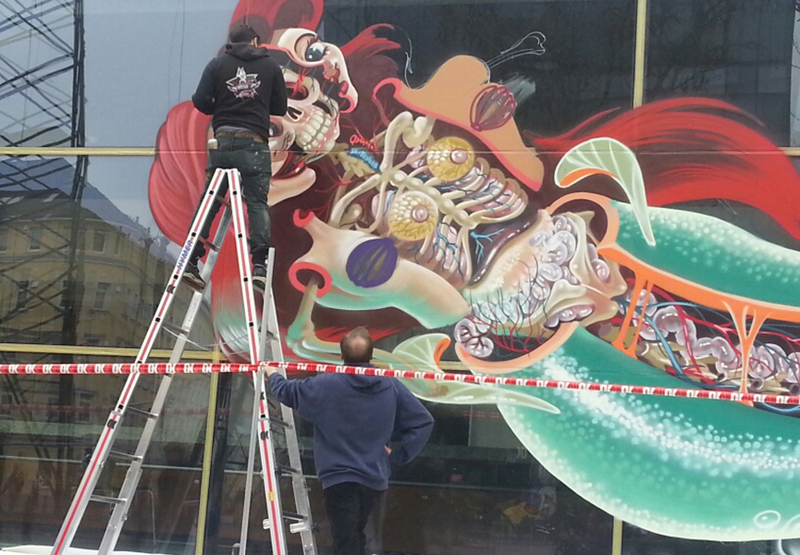 Characteristic for Nychos he splits open the comical anatomy of his subjects to reveal the imagined insides. 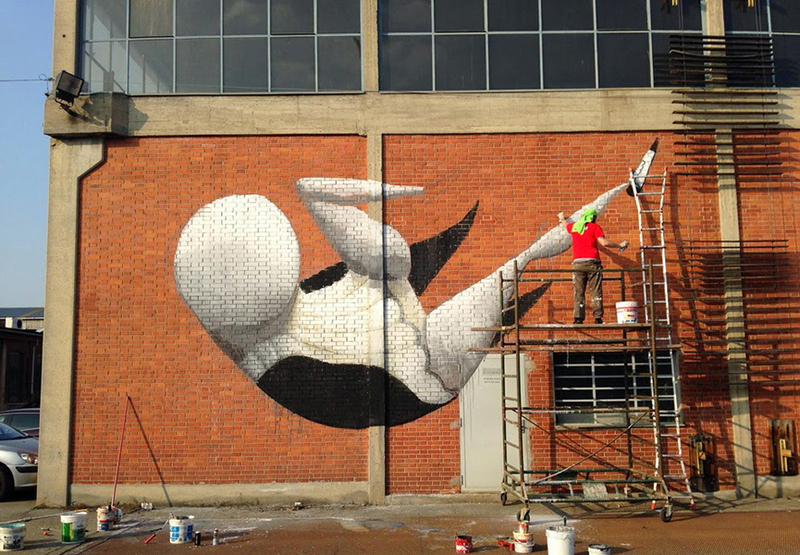 Spending time in Turin for his exhibiton at Galo Art Gallery the Italian street artist Zed1 also took the time to paint a large mural on the side of a red brick house. The 1920’s caricature of a man and a pug are accordingly titled “The Artist’s Boat”. As the paper boat is about to be tipped over by a ‘massive’ tidal wave the pug wraps himself around the mans face in an effort to avoid the imminent contact with water. 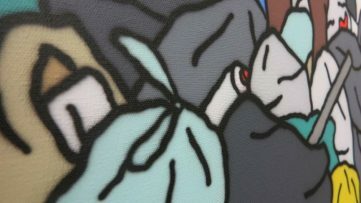 The piece is a representation of ZED1 signature cartoonish-children’s-book style that always puts a little grin on your face. 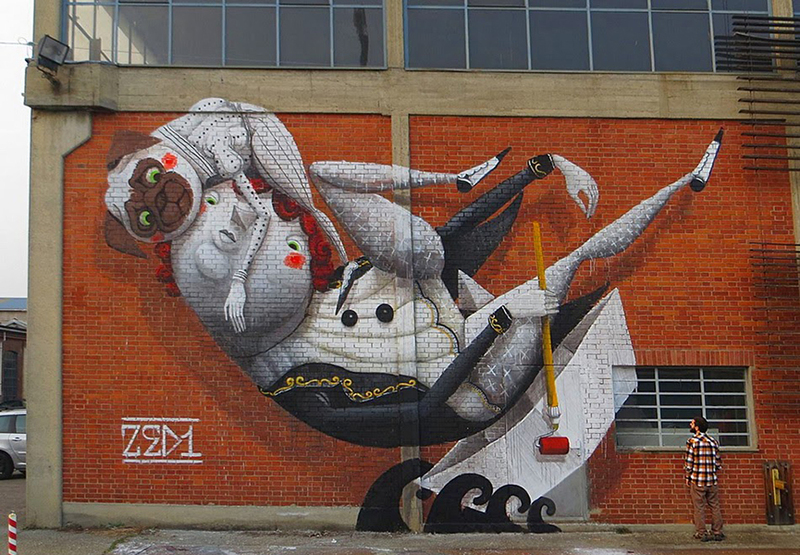 The German street art duo Herakut is still traveling throughout the world to paint. After Jordan they have now arrived in Los Angles. 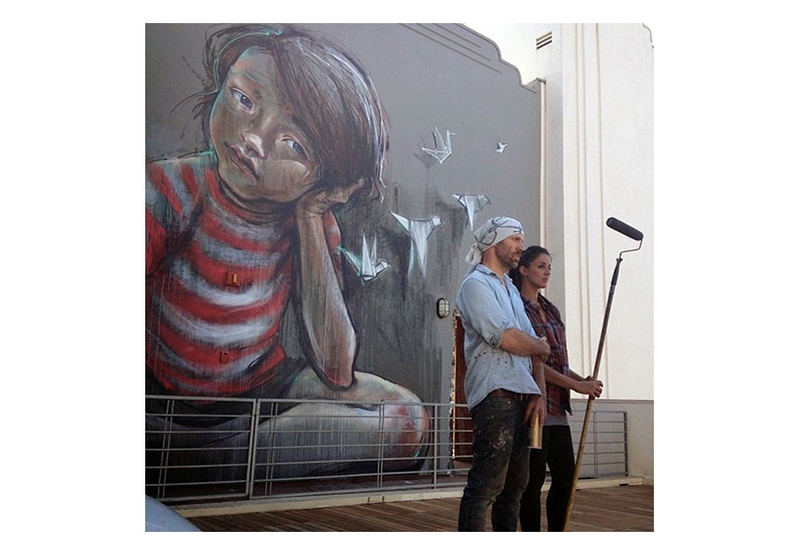 Herakut was invited by Industry Partners and Le Basse projects to paint two murals on community property to beautify the neighborhood. 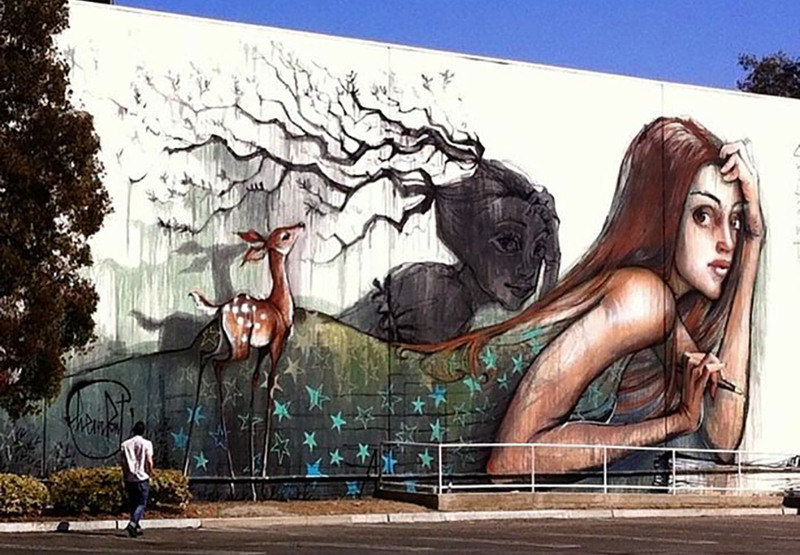 The murals show Herakut’s delicate art skills. 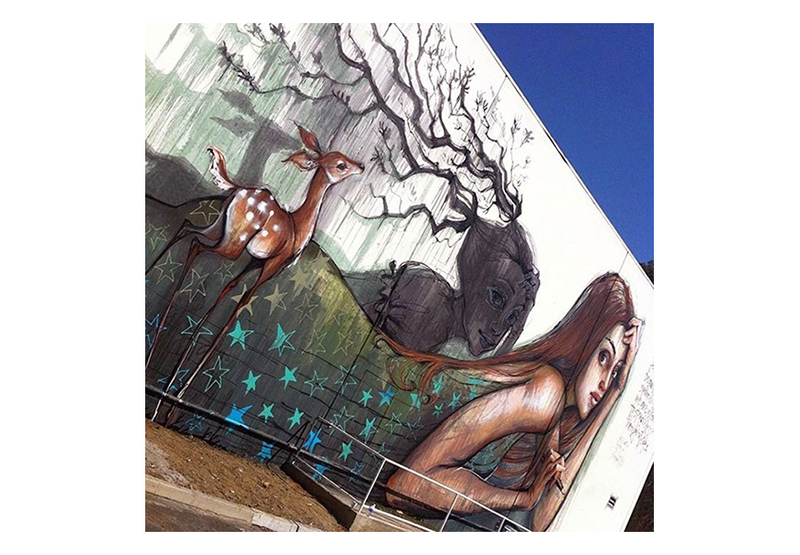 One mural is a girl lying down with a shadow behind her back with tree antlers. 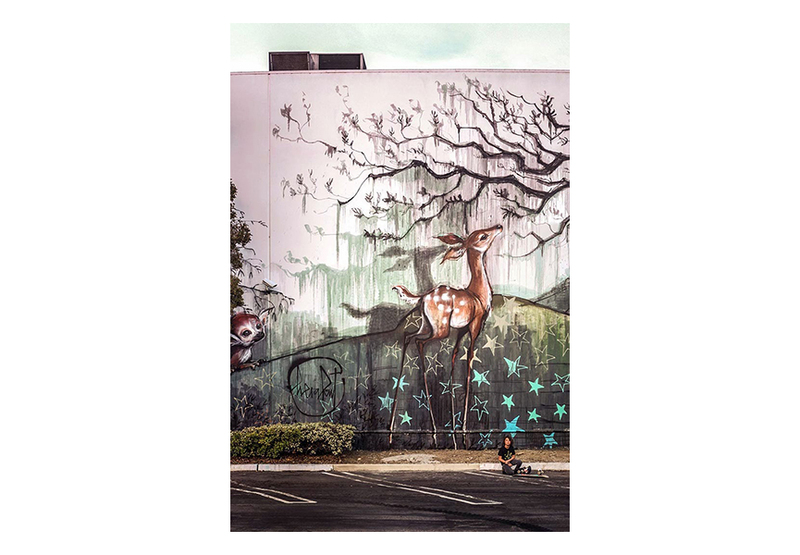 A small deer stands beside the girl. 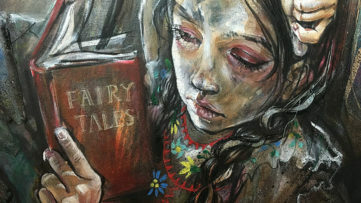 It has a forest-mythical touch that is new for Herakut. 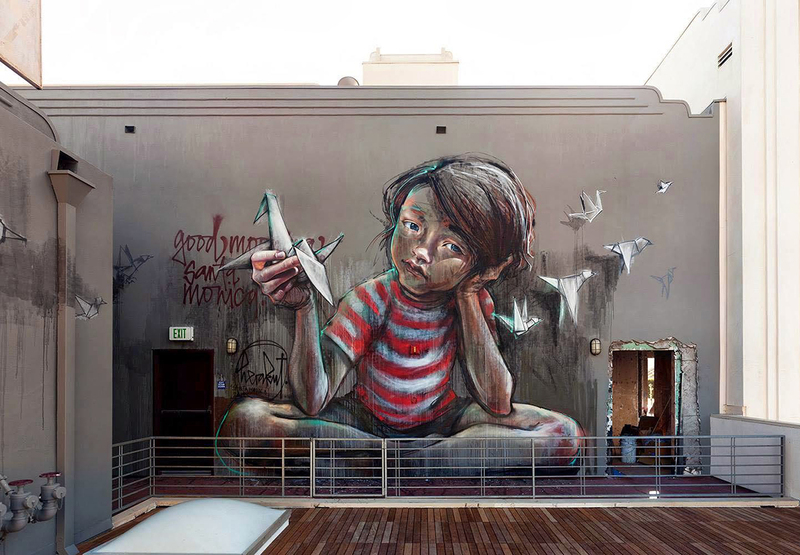 The second mural shows a small boy, sitting cross-legged, with an origami crane in his hand. Five other origami cranes are flying away from the boy. 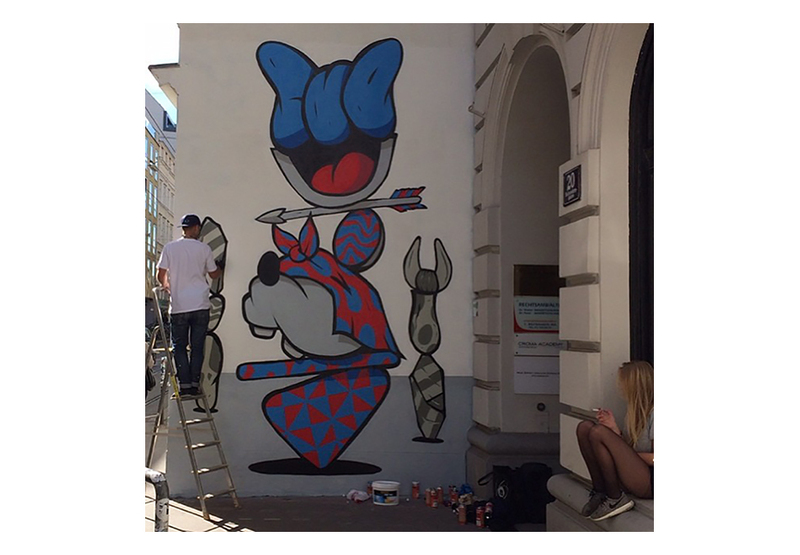 Both murals have definitely adorned and helped the area to build cultural value. 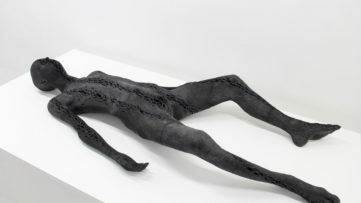 Sculptures by Urban Artists on View at Galerie Mathgoth!